We took fragrant wild mushrooms and champignons, added a few drops of the finest olive oil, then expertly combined them with celery, potato, onion, tomato and a rich blend of aromatic spices. 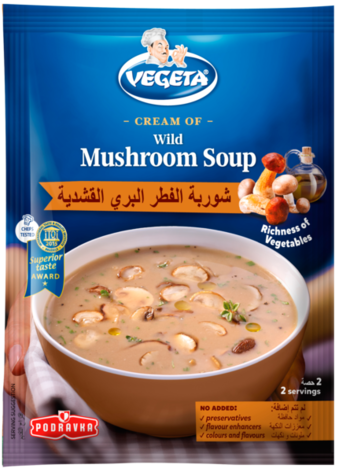 The result is a perfect harmony of flavours in a rich, satisfying cream soup. Absolutely delicious! Empty the contents of the packet into 500 ml of lukewarm water and bring to the boil, stirring constantly. Simmer for 5 minutes, still stirring, and serve. Ingredients: skimmed milk powder (cow), corn starch, wheat flour, dried mushrooms (wild mushrooms, champignons), palm oil, dried vegetables (potato, onion, celery, tomato), iodized salt, yeast extract, maltodextrin, lactose, olive oil, garlic, milk proteins (cow), lovage leaves, black pepper, parsley leaves, nutmeg, sweet red pepper, thyme, turmeric. Contains gluten, celery and milk (lactose). May contain eggs.